The Best Experience Buying Real Estate in the Riviera Maya! The Live It Tour is a house hunting experience that will change your life for the better. This is an intensive tour where you get to visit different properties and neighborhoods in the company of an expert Buyer’s Representative from Top Mexico Real Estate. They will answer all your questions regarding the real estate market, as well as overlooking every detail of your tour. We will take you to private one-on-one talks with industry experts to learn about the legal process, rental possibilities and much more. Whether you are searching for a vacation, investment or retirement property in the Riviera Maya, this tour is for you! With the Live It Tour you will learn all about investing in Mexico and how to make an educated purchase. The tools provided with the purchase of this tour will show you the market trends and help you narrow down your property options. Moreover, you get FIVE hours of online courses. When you arrive in Mexico, you will be prepared with all the right questions for your Buyer’s Representative. You decide when you want to travel. In the meantime, you will be working closely with your Buyer’s Representative, who will help you choose properties and neighborhoods for you to see. When you arrive, your tour will be ready. And you can have it all for just $649 USD! But…can’t I look at properties for FREE? Yes, you can. But the Live It Tour is not just about seeing properties. It is a full learning experience about the Mexican real estate market, the trends, finding the perfect investment with someone who is knowledgeable of the Riviera Maya, and having one-on-one sessions with industry experts such as lawyers and property managers. 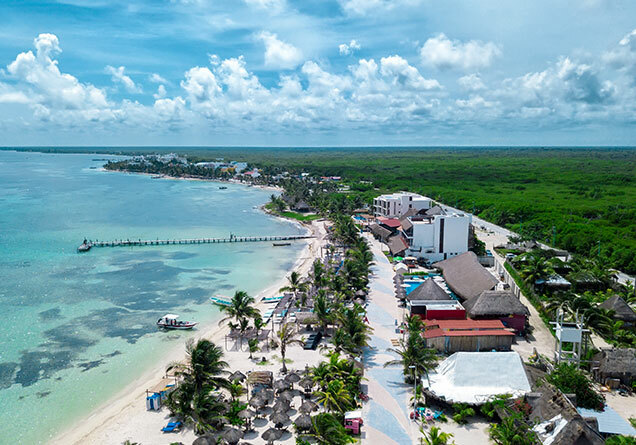 When you travel to the Riviera Maya through the Live It Tour you are saving 50% of the actual cost of coming down here and doing it on your own. Plus, you get the added value of obtaining education from the top selling real estate agency in the region. Moreover, our expert Buyer’s Representatives will narrow down which neighborhoods are suitable for you depending on what use you want to make of the property. The intensive tour includes plenty of activities for you to become fully aware and knowledgeable of the process of becoming a homeowner in Mexico. And it is personalized towards your individual needs – investor, retiree or vacation-seeker! * No payment needed at this point. What Does the Live It Tour Include? This is an experience made for serious buyers who are ready to purchase their dream paradise home in the Riviera Maya, Mexico. * No payment needed at this point, we will get in touch with you to work out the details. Why is Top Mexico Real Estate the Option? Glad you asked! Top Mexico Real Estate has over 10 years of experience in the Mexican real estate market. It is also the #1 real estate company catering to Americans and Canadians in the Riviera Maya. Our founder and CEO, Thomas Lloyd, was the first-ever person to receive a Degree in Mexican Real Estate from the Mexican Board of Education (SEP) and has helped over 1,000 couples, singles, families and retirees find their dream home in Mexico. But what really sets Top Mexico Real Estate and the Live It Tour apart from other similar options available is that we offer exactly what you want to see according to your budget, wants and needs. As Buyer’s Representatives, it is our goal to show you what you want to see. We will take you to see resale properties and preconstruction options, no matter whom the developer is. Other similar trips limit you to one single developer. That is not the case with the Live It Tour! If you’re ready for the exciting journey of becoming a homeowner in Mexico, there is no better way than through the Live It Tour! And hey, you don’t need to take our word for it. Listen to a couple who found their dream home with the Live it Tour! This 4-day/3-night experience is available for whenever you feel ready to take the next step. Wrap up that online research and experience it in real life in the Riviera Maya! Mexlaw is a law firm based in Mexico that is operated by Canadian and American lawyers with vast knowledge and expertise in the real estate industry. Their team is comprised of both international and Mexican lawyers to offer the best legal services to their clients. Focused on real estate legal services, they also offer immigration, legal and escrow services. Their founder and CEO, Charles Tibshirani has over 35 years of experience both in Canada and Mexico. Over the past five years, Samson Waters has been offering property management and vacation rental services in Playa del Carmen. They have a proven track record of success. Their international team, led by founder and CEO Rick Turenne, focuses on helping owners maximize their investment. Samson Waters caters to Americans and Canadians who have invested in vacation rental properties. *No payment needed at this point, we will get in touch with you to work out the details.